If you have ever wanted to try playing a musical instrument this is your chance. 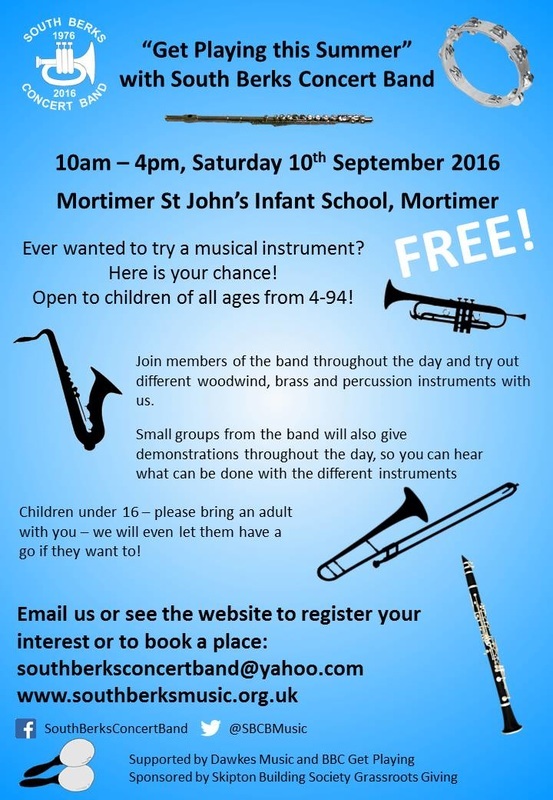 South Berks Concert Band will be offering a free workshop day at Mortimer St John's Infant School from 10am-4pm on Saturday 10th September. It is open to anyone from age 4 upwards, children and adults. We ask that children under the age of 16 bring an adult with them. There will also be demonstrations by band members so those attending can hear some examples of the types of music that can be played on them. The day will run as three 2 hour sessions (10am-12noon, 12-2pm and 2-4pm), so please book up for which one you would prefer to attend. There will be a limited number of spaces on each session, so we recommend you contact us early to avoid missing out. The event is part of the BBC's "Get playing this summer" campaign, and we are also being supported by Dawkes Music who will bring along a range of instruments to try, and will also be available alongside band members for people to ask them questions. To help us plan the day, we need to know how many people are interested in the event, so please let us know if you would like to come along. Please email us at southberksconcertband@yahoo.com or fill in our booking form. We will acknowledge any emails received and then send out further details.